This section contains pictures and comments for selected Blizzard maps (the ones I've played enough to have an opinion about). Click the small pictures to see blow-ups of the maps. 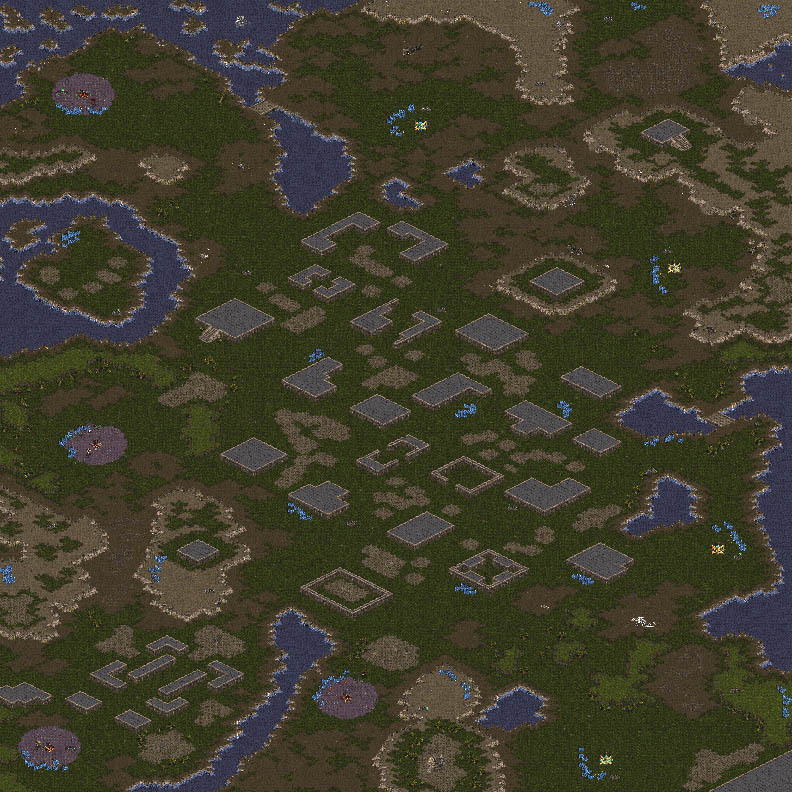 To see pictures of the rest of the maps, go to the Starcraft Compendium's maps page. -- Fair, fun, flawless; perfect in every way. -- Good but with minor flaws or slightly less lively gameplay. -- Flawed but ok for playing once in a blue moon. -- Unimaginative, ugly, unstructured, and/or unfair. Homeworld (192x192, jungle) -- Another great map. This one has start spots mostly surrounded by walls. There are expansions between the spots, up against the edges of the map, plus 16 three-clump patches scattered through the middle that nobody ever mines. The start spots are connected to the center by bridges; these choke points can become traps if used properly. Also the start points have access to each other by going around the edges of the map through the expansions. It is somewhat easier to hide expansions on this map because the extra resources are located at the edges, so be sure you reconnoiter thoroughly. Also, don't forget that each start spot has two entrances. If you are attacking an opponent's "front door" and you find that it is heavily fortified, try running around the back. Your opponent may not have defended it so well. Green Valleys (256x256, jungle) -- This huge map is also star shaped, somewhat like Char Magma. Make sure you get zergling speed and zealot legs because it's a long walk to anywhere. There are two patches of minerals (13 total clumps) at each start (only one geyser though) PLUS minerals and gas about halfway to the center. In addition to this, the raised plateau surrounding the "green valleys" also contains lots of minerals and gas. There are no ramps, so you must transport workers (or fly command centers) up to these areas. If you do establish a base up there, you can be pretty sure no one will find it for a while, as the map is huge and people almost always neglect recon on the plateau. . The Hunters (128x128, jungle) -- This smallish (for an 8-way) map is vaguely star-shaped, with expansions in funny places in a kind of ring around the center. Start locations have 10 crystal clumps and a geyser. Eight of the crystal expansion sites have six clumps; the one in the center has seven crystal clumps. There are seven expansion geysers (not eight); some are closer to crystal sites than others. Not all of the start locations have equal access to the expansion resources; bottom right, bottom center and top right have a good deal, while top left and top center pretty much have to fight it out for the nearest expansion spot. Center left and center right have good access to minerals, but not to gas. Bottom left's expansion gas is pretty far from the expansion minerals. Bearing all this in mind, it seems best to hide new towns in a vacant start spot. Also the expansions are too near the center not to be noticed. The Hunters' small size makes it something of a rush map, but its odd shape may just make up for that. Although this map is not terribly fair; I find myself playing lots of games on it because it is popular. 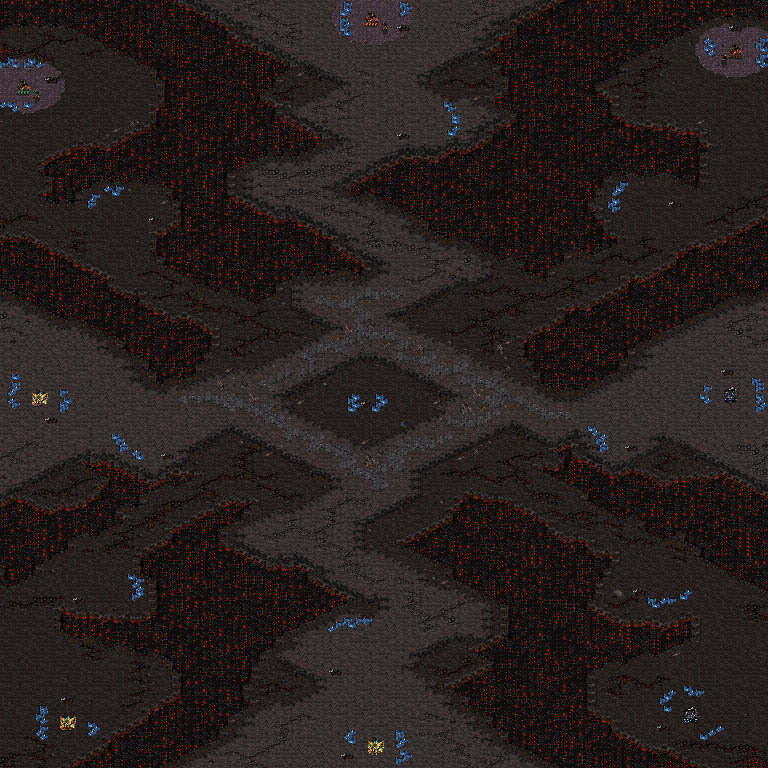 Eruption (128x128, jungle) -- Eruption was Blizzard's third .SCM of the Week; it was also the first SotW that's good for playing big allied games. The starting positions are in my favorite configuration (1-2-4-5-7-8-10-11 oclock); each start has eight crystal clumps and a geyser. In addition, each spot has a ramp-accessible plateau which contains another five clumps (well, except top left, which has six, oops! ), but alas no gas. To get more gas you must take a vacant start spot or grab one of the expansions in the middle; there are eight of these, and each has three crystal clumps and a geyser. However, be careful mining the middle, as many of the middle expansions are vulnerable to ranged ground attack from the start spots. Note that the middle is a big plateau with ramps leading down to the start spots; the usual pointers about controlling the ramps apply. You can put troops at your choke point to protect your base and expansion from ground assaults, but watch out for hit-and-run flyer attacks at your rear. This is a great map and I hope people start to play it. I hope it ends up on the expansion CD, too. 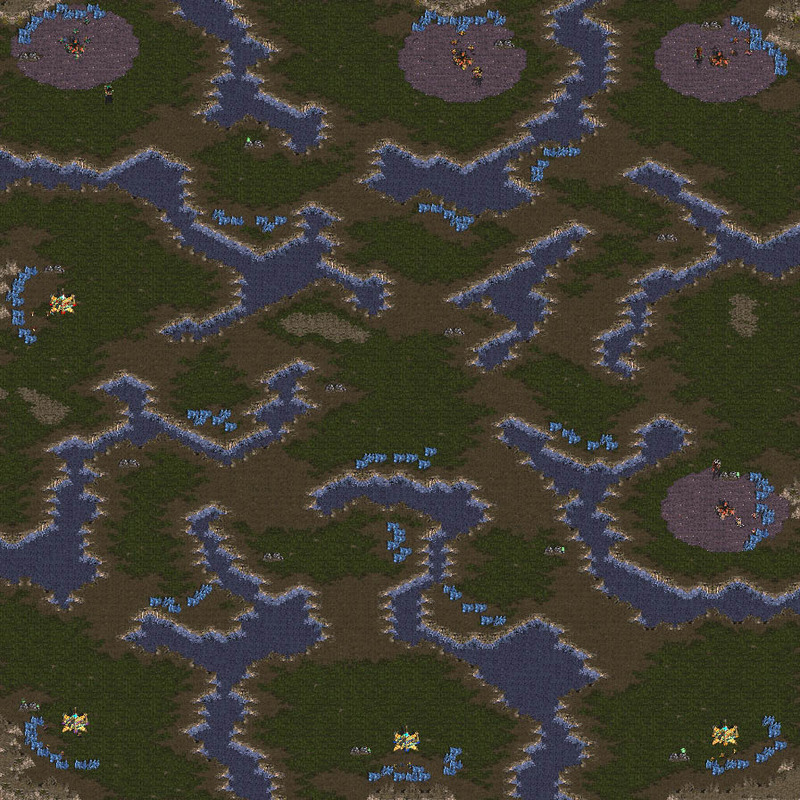 Elderlands (192x192, jungle) -- This was the first Starcraft map I made, and Blizzard made it their sixth .SCM of the Week. The start spots are arranged in a circle about halfway between the center and edge of the map. Four plateaus go diagonally from center to corner; these plateaus dominate the start spots, so don't let your enemies sneak any tanks up there. Start spots have only six mineral clumps (nine originally, Blizzard changed this), so you should try to secure an expansion early. Expansion points are located on the plateaus (six mineral clumps), at the edges (eight clumps), in the corners (eight clumps), and in the center (four locations of six clumps each). The center is a strategic area, as most assault groups travel through it -- fortifications should generally face toward the center. However, each base has a back door and a side door. These other entrances take more effort to use, but hitting from the blind side can be a decisive tactic on this map. There are lots of places to hide towns, so go ahead and expand -- your enemies may not see your new bases. I really like this map (but then again I'm a little biased); too bad Blizzard killed it by reducing the starting minerals. 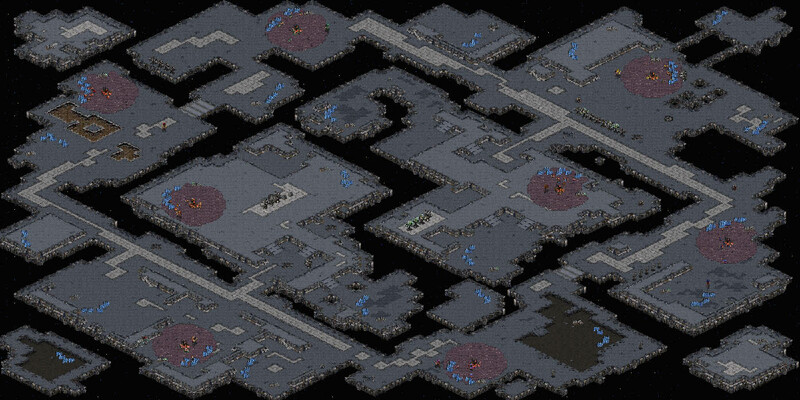 Station Unrest (256x128, space platform) -- This long skinny map is bit of a mess. There is a loop which runs around the map; six start locations are on this loop. The other two start spots are on nodes of platform jutting into the middle of the map. Add this to the almost always confusing and unappealing nature of the space platform tileset, and you get a pretty frustrating place to play. Two of the start spots are located directly in the only two east-west paths and another is almost as bad on the right hand side. There is no way passing troops could fail to notice these towns. The other spots are well off the beaten path, especially the two middle spots, which have a single choke point to defend (with high ground to shoot from! ), and access to expansion minerals and gas behind the choke. At least the start spots all have the same number of crystal clumps (six). Land-accessible expansion spots seem to have five clumps and a geyer. 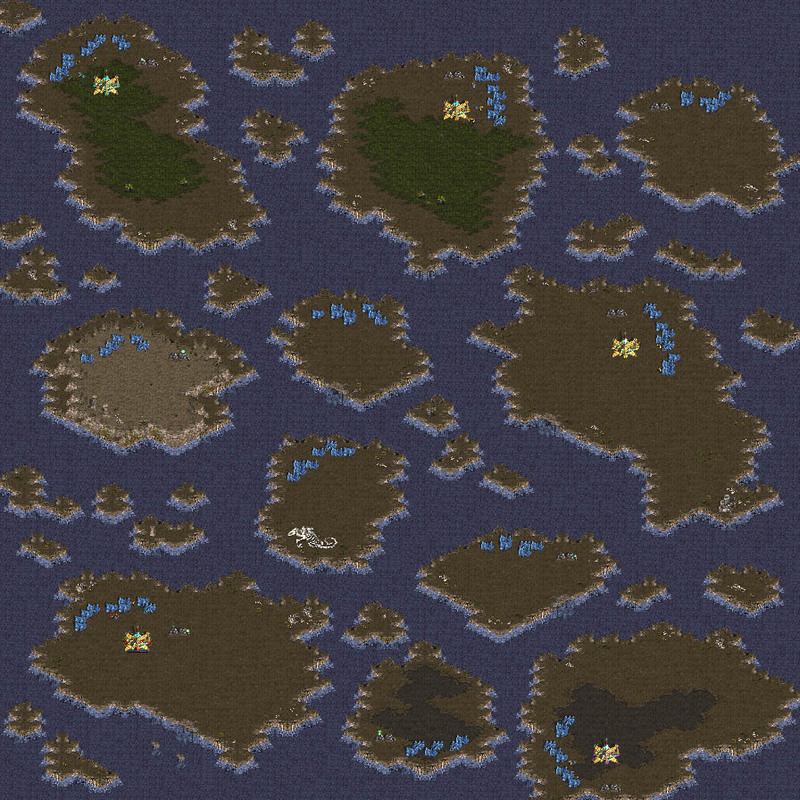 Island expansions have either four clumps or a geyser (with one 5-clump+geyser exception near top right). Anyway, I'm not too thrilled with this map. Sherwood Forest (192x192, jungle) -- This one is good for a quick 2v2 game -- you aren't quite sure where your opponents will be. The five start spots are surrounded by walls, with ramps. 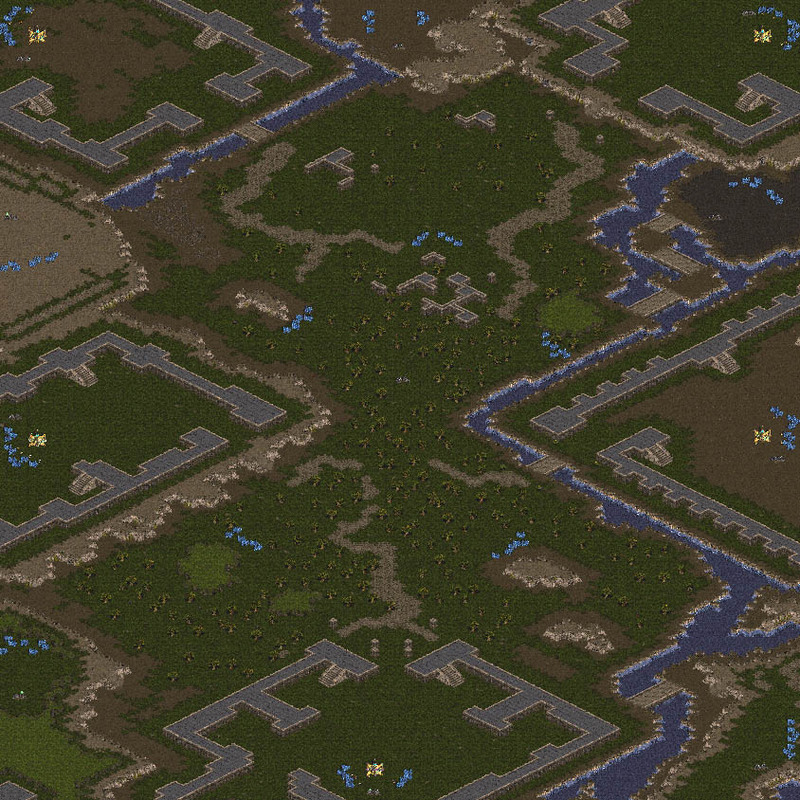 If you are a lover of big Terran defenses, you'll love Sherwood Forest -- the walls seem to be made for seige tanks. This defensive setup is offset by the relative openness of the map; apart from the choke points leading into the bases, point-to-point navigation is easy and fast. Rushes are common. The start spots each have nine mineral clumps and a geyser. Between the start spots lie five expansion bases, each well protected by choke points and containing seven clumps and a geyser. In the central forest are five more expansion spots, with six clumps apiece (no gas though). There is a lone geyser in the center. The middle area is dotted with trees, so remember that units hiding under trees receive a defensive bonus when attacked from the air. 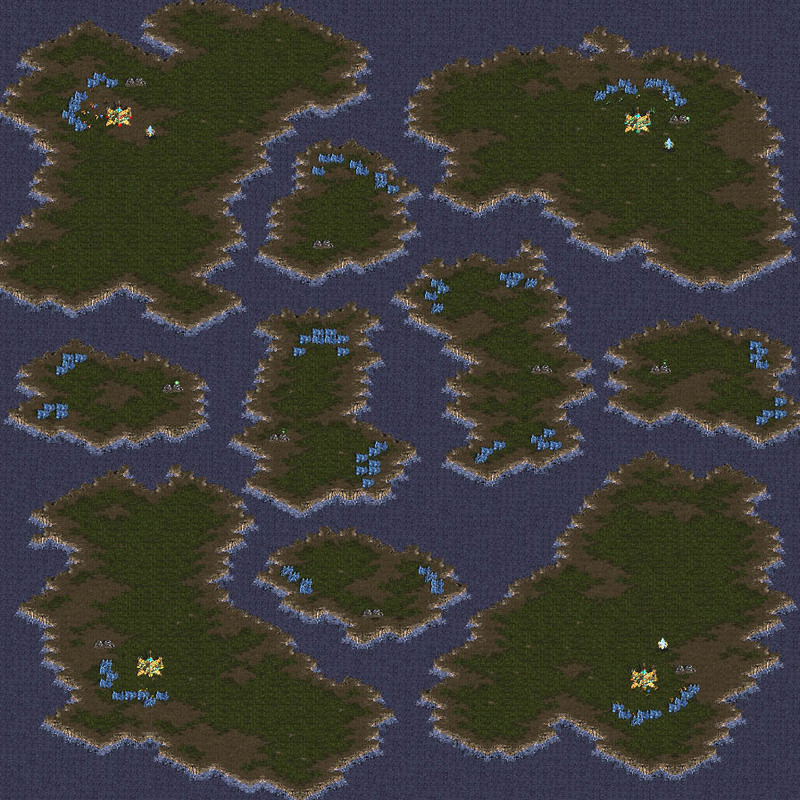 Island Hop (128x128, jungle) -- This is not a great map, but it is one of the few medium-sized island maps on the Starcraft CD. The five starting locations allow for at least a little bit of uncertainty in a 2 on 2 game, but the odd placement of the start spots and the uneven distribution of expansion locations hinder this map. Initial resources are nine mineral clumps plus a gas geyser. The bottom and left side starting positions are isolated and not surrounded, but the two positions at top right are crowded together with possible enemies on either side. 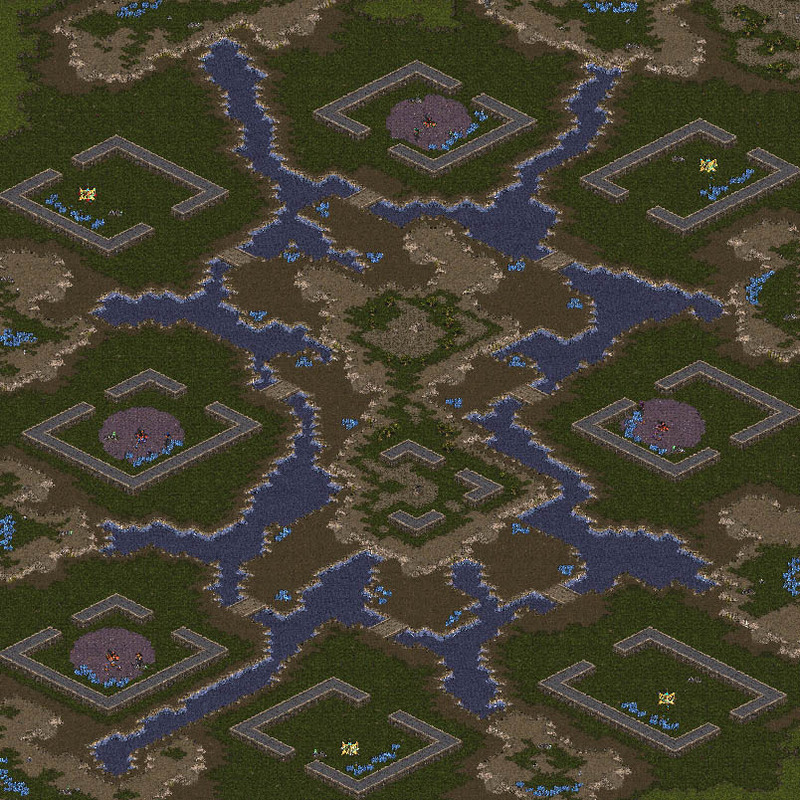 All five islands are spacious enough to allow for terran sprawl with room left over for an invasion force to land. There are six expansion locations. Four of these have six clumps and a geyser, but the two centermost spots have eight clumps and no geyser. For the typical gas-hungry island game, these no-geyser expansions are not useful. In addition, the expansions with gas are distributed unfairly -- bottom left has easy access to two of them, while the rest of the start spots must compete with neighbors for the closest gas expansion. A Bridge Too Near (128x128, badlands) -- If you have to play a four-player map and for some reason you can't play on Lost Temple, then try this one. :) Minerals are a little scarce: you get only six mineral clumps at your start location and five more at on a nearby ramp-accessible plateau. The other four plateaus also have five mineral clumps, but they have no ramps. Each mineral site has a geyser. 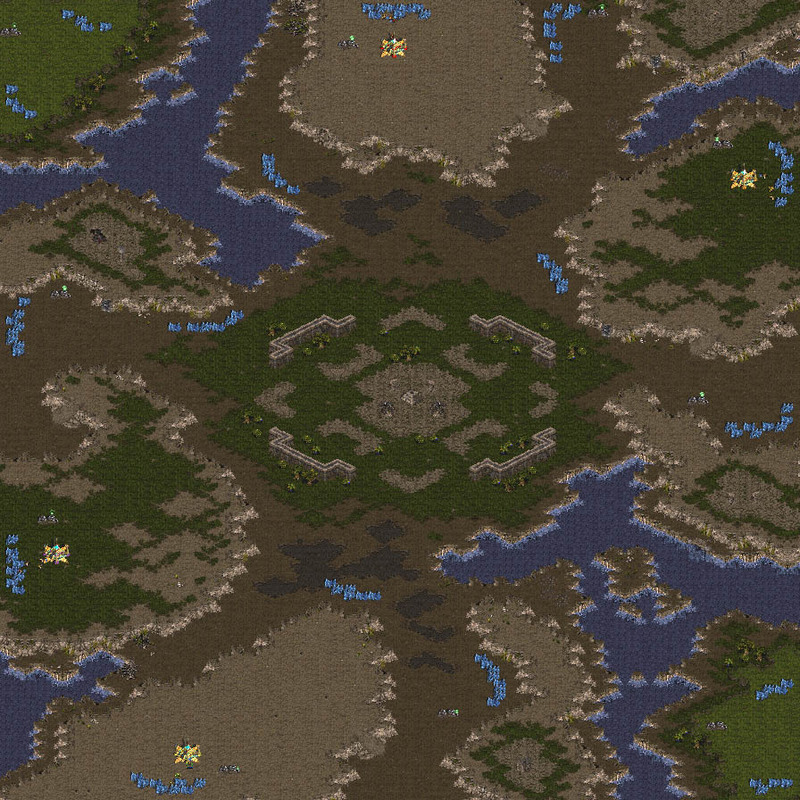 The central island is connected to the four start locations by narrow, easily defended bridges; look for FFAs on this map to become possible air wars, especially if there are a lot of Terran players. Notice that the top two spots have their ramped expansions next to each other, and that the bottom two spots have their non-ramped expansions next to each other. Since resources are so scare you would do well to steal your neighbor's minerals, either by killing him (my favorite way) or by sneaking into his non-ramp expansion spot. Make sure you have adequate anti-air forces on your non-ramp expansions, as you can't just run in a group of hydras to help out. 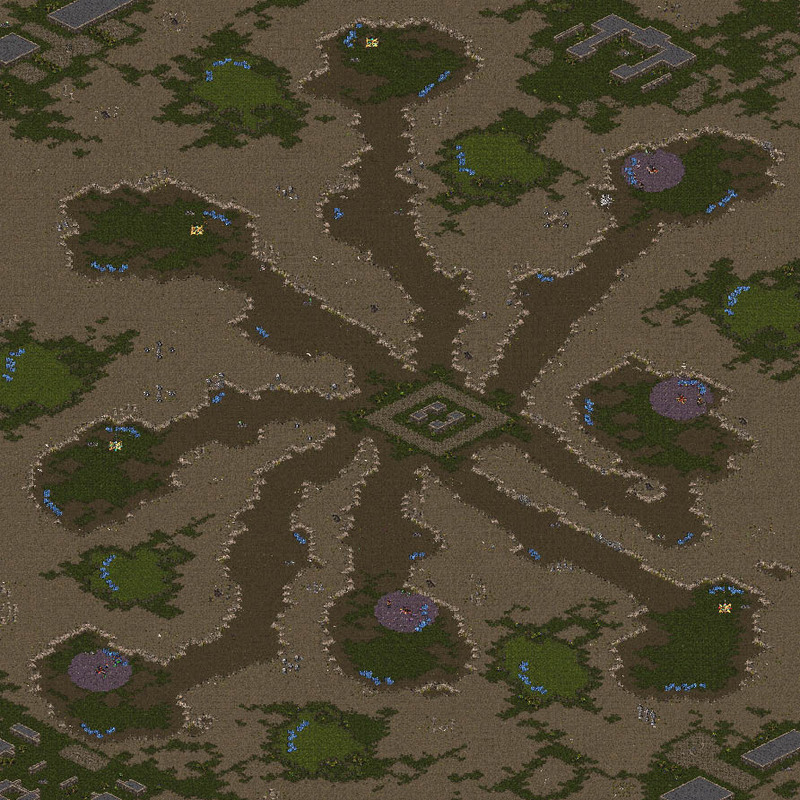 Zerg players would do well to burrow zerglings in the center island and bridges for recon. Dire Straits (128x128, jungle) -- This excellent map offers fair starting positions and a wealth of expansion choices. The four start positions are located on large islands, with eight mineral clumps and a gas geyser. The six expansion islands are distributed equitibly between the start locations. The four smaller islands each have eight mineral clumps and a geyser. The two larger expansions each have a whopping fifteen mineral clumps plus a geyser, but these resources are so spread out that at least two headquarters buildings would be required to collect them efficiently. The main flaw in this map is the uneven layout of the resources on the six expansion islands. There is only one spot where a resource collection building fits snugly between minerals and geyser (bottom section of leftmost large expansion island), and the other sites vary from pretty good to downright awful in terms of town hall placement. The worst offender is the bottom center island, where the minerals are divided into two clumps of four and separated by such a great distance that two town halls fit in between with room to spare. Despite the flaws in the expansions, this map is largely fair and is played regularly on Blizzard's ladder.